The awareness about different types of mental illness needs to raised and this is an indisputable fact. Many famous figures and celebrities lost their lives due to such an illness – Anthony Bourdain, Avicii and Kate Spade were among them. Depression is a worldwide concern that needs to be battled and the main tool should be information. Most people are not aware what depression is and how it affects different individuals. They are unaware of the treatments, too. Those are the main reasons why many people consider depression to be a temporary state of mind that can be shaken off easily. Unfortunately, it cannot fade away by itself. People need to realize that this is a delicate matter and only those who have suffered from it can speak about how it feels like. You should never judge a book by its cover and you should also show some tolerance for the people who suffer from it. 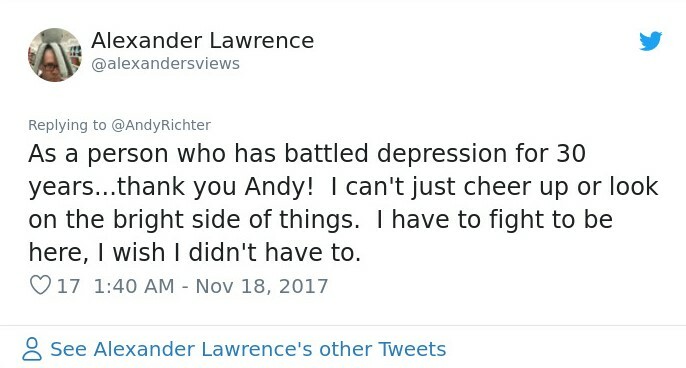 The famous comedian Andy Richter definitely has something to say about depression. 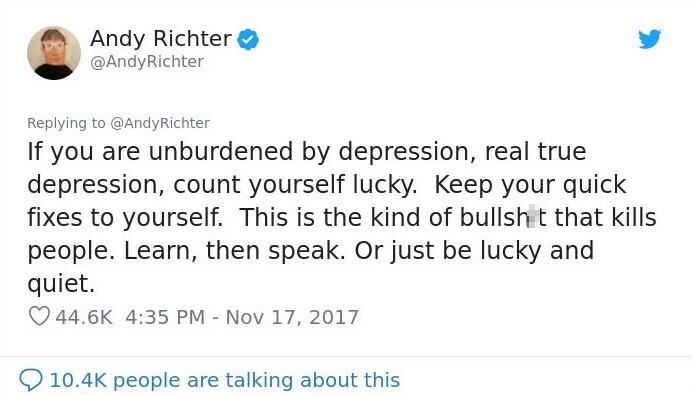 When someone posted on social media suggesting that depression was nothing more than a choice, Richter decided to step in and say what he had to say. The comedian is famous mainly for his one-liners featured in the Conan O’Brien show. 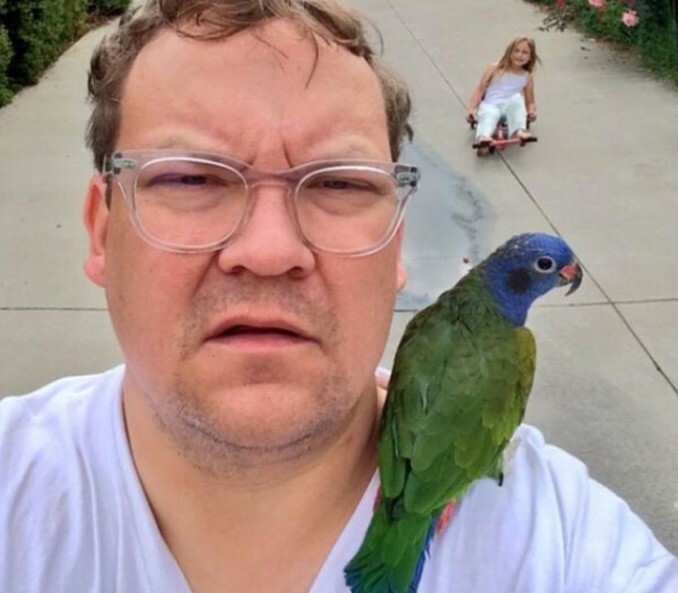 He is a really funny guy and his gigs are hilarious but nothing is what it seems. When the curtain falls, Richter transforms from the merry entertainer to a man suffering from depression. Nobody would suspect such a thing but this type of mental condition often lies beneath the surface and it is unrecognizable. 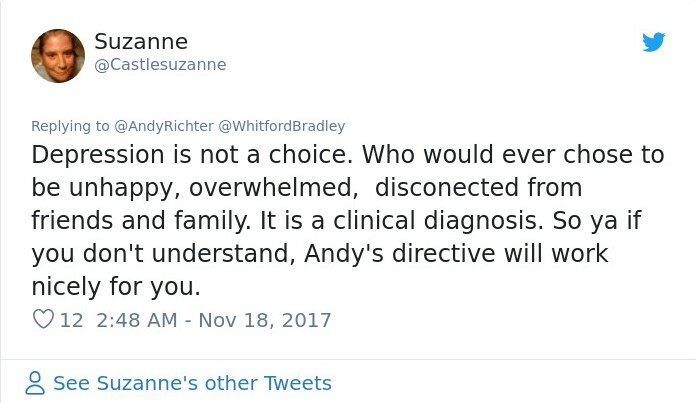 We believe that this Twitter user had no idea what depression is when she tweeted ‘depression is a choice’. This is a concept that probably many people believe to be true. However, it could not be more wrong than that. 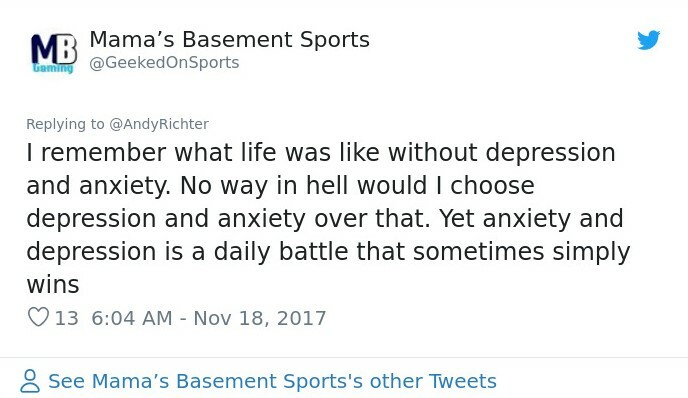 If it actually was a choice, nothing would be wrong with nobody, because everyone would choose not to suffer from depression and feel bad all the time, right? The comedian saw the tweet and immediately felt anger because he was probably fed up with hearing similar things. He wrote just one line but it was explicit enough to show his emotions. It was also a funny one but it still needed to be censored. We are sure that everyone got the message. Some of you may think he went too far but he didn’t. he only reacted accordingly to the way he felt after reading the tweet. 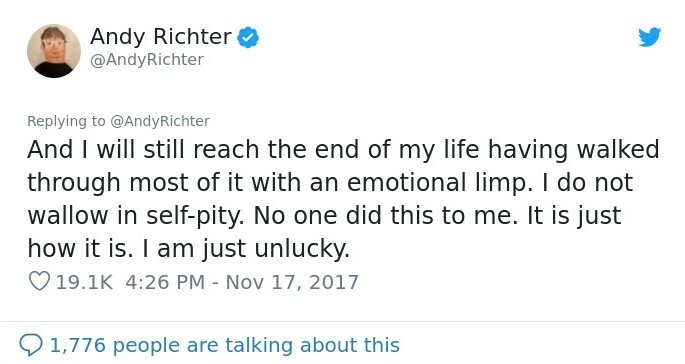 Richter posted a follow-up tweet saying the he was going to say what is on his mind no matter what. He pulled off with his car after which he decided to finish what he started and explain what depression really is to those who are ignorant enough to call it ‘a choice’. Of course, nobody is obliged to study the illness in detail but if you are not sure what you are talking about you are better off not posting facts that are not true. 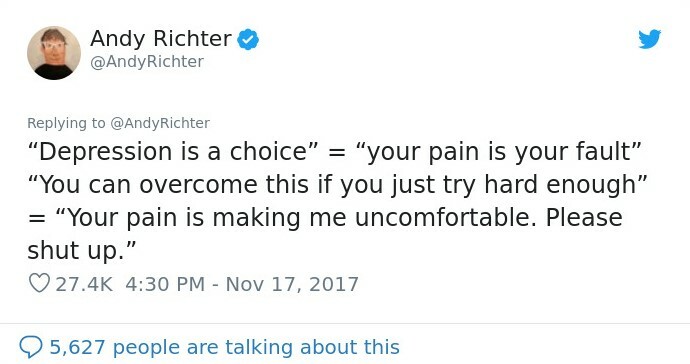 Things got a bit personal and Richter decided to open up on his own experience. He was sincere enough to share with everyone that he suffered from different forms of depression pretty much his whole life. The 51-year-old comedian even explained in detail how this felt in its different stages. He made sure to describe it in his own way and we believe that those who have never felt what it feels like got an initial idea about it. The story continued in another tweet where the brave man continued with the revelations about himself. He shared that medication, therapy and other procedures were a constant part of his life for years. However, he also added that nothing related to depression stood in his way to be a happy person. He mentioned that he loved his wife ever since he married her 27 years ago. He added that his kids were the best people he ever met. It is a really sweet way to put it! Adding that he was a lucky man really topped off the revelation and we really think that he is absolutely sincere in his words. 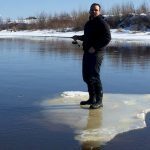 The comedian continued with his story by adding that he will give his best to live life to the fullest until the final day. It seems that he accepted his condition many years ago and got used to it. As he described it, the ‘emotional limp’ has always been within him and probably will be until the end. He admits that he considers himself unlucky when it comes to this part of his life. The way that Richter made the comparisons you see is really accurate and a bit sarcastic but it is totally in his style. He chose the right words and exposed the misconceptions for what they really mean. We agree with him and we believe that people can easily say things like these when they feel uncomfortable about the mental illness. The way to deal with this is for these people to educate themselves on the subject of mental illness. 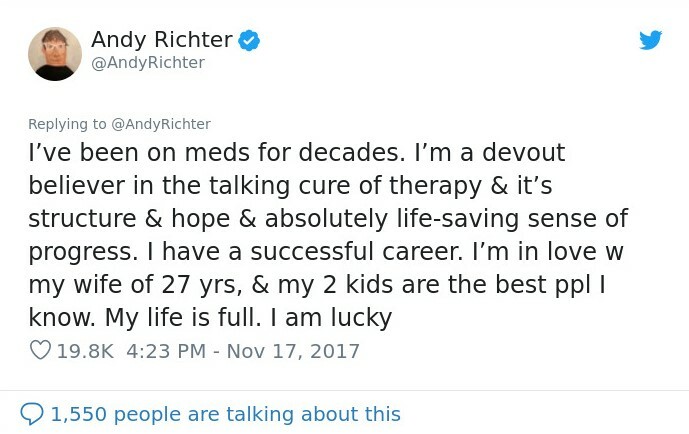 Richter is absolutely when he says that those who never suffered from depression should consider themselves extremely lucky. He explained things in a rather simple way. If someone is battling depression or is educated on the matter, they may speak about it. Those who have never felt its burden and have no idea what it feels like should restrain themselves from commenting. A lot of people followed his tweets and made sure to support him and approve everything he said. As you can imagine, he was very emotional over the whole thing and sharing everything about his personal life was probably not easy. It takes courage to speak out loud about personal issues of such a signifficant scale. 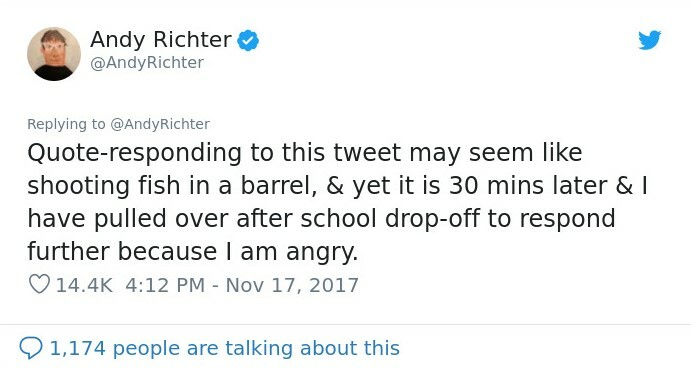 As it turned out Richter was so focused on tweeting his story that he allowed a mistake. He miscalculated the exact number of years since he got married. Richter accidently added four years to the actual 23 years of happy marriage between him and his wife. The tweet is hilarious and this is what you would expect from a comedian after all. He finished the series of tweets with this post. Richard Marx needs no introduction. He immediately related to Richter’s point of view and especially the way he described the struggle. As it turned out, Marx has pretty much the same experience. It seems that many people have such a hard and never ending struggle within themselves. This is one reason you should never judge others no matter what. Only they know what’s inside of them. Saying that people should have more empathy for others is something we can support any day. This is a problem because people tend to show no empathy for things they cannot relate to. The right way to make the others feel comfortable is to stop judging them or making assumptions based on literally nothing. 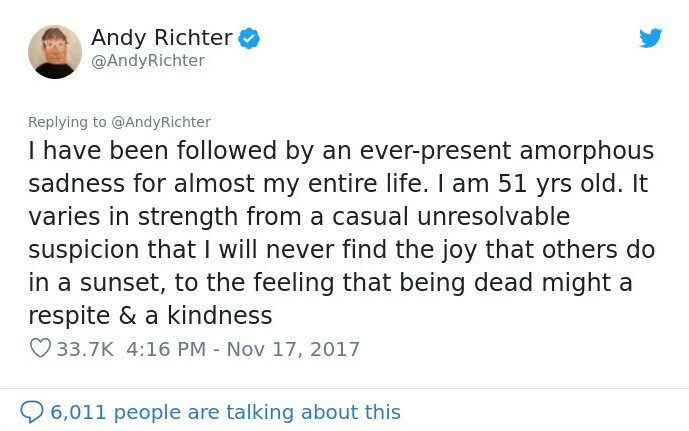 Richter’s post was probably inspirational for many people and part of them shared their own stories. This person explained that his fight with depression goes on for more than thirty years. The person explained that the main thing that makes life with depression hard is the inability to just let everything go and be happy for the moment. We guess that it takes a lot of struggle to feel that way when you know you are depressed. 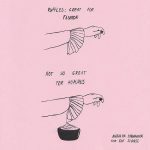 This user commented on the topic by saying that they knew what it is like without the burden of depression and anxiety. Keeping that in mind, it would be hard to choose them over their absence if they really were a choice. Sadly, they are not. Anyone struggling with this condition knows that. Nobody would like to constantly feel in a similar way which is why misinterpretations like the one that sparked the whole thing are just plain wrong. This user turned out to be a nurse. She explained that chronic depression is a medical condition so severe that sometimes medication is useless. 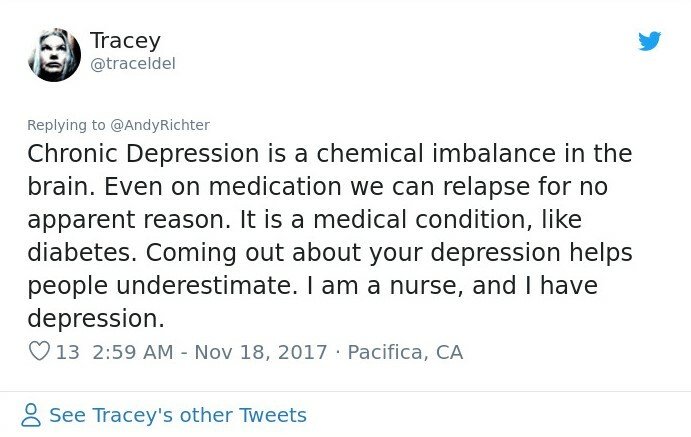 The cause of the illness is a chemical imbalance in the brain and that is definitely not something you choose to have. We hope that all these posts will give people enough information about the condition.